Education systems differ from one country to another and the terminology can be confusing. Here is an overview of the educational levels in Ontario. Schooling at the elementary level spans 8 years. At the secondary level, students attend secondary school from grades 9 to 12. The secondary school diploma is the requirement for entry into a postsecondary educational institution. 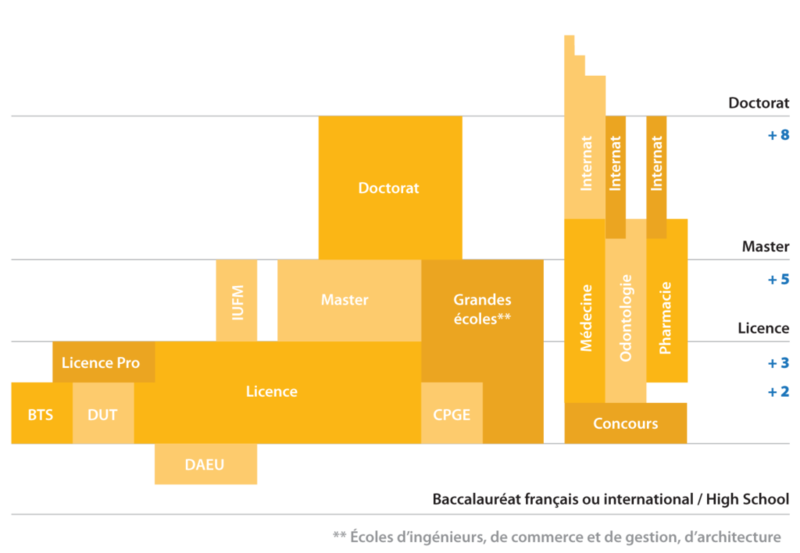 Postsecondary studies take place in a university or a CAAT (college of applied arts and technology, commonly designated “college”). College programs of study focus on trades, technical professions and practical training. They vary in duration: students can earn a certificate (1 year), a diploma (2 or 3 years) and, in certain colleges, a bachelor’s degree (4 years). In our universities, undergraduate programs last either 3 or 4 years and lead to a postsecondary diploma known as a bachelor’s degree. 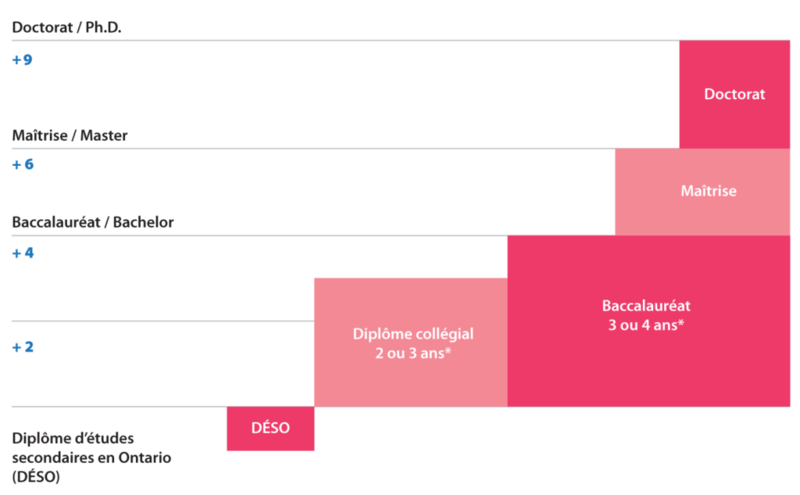 Holders of a bachelor’s degree can undertake graduate studies: at the master’s level, programs last 1 to 2 years; at the doctorate level, they last a minimum of 4 years. Here are some essential points to consider before leaving home and upon arriving in Canada. Before coming to study in Ontario, you must inquire about ways to facilitate your stay and take the appropriate steps. Canadian embassies and consulates, as well as visa offices abroad can provide detailed information on the necessary authorizations to study in Canada. demonstrate that you have adequate financial resources to cover your tuition fees, living expenses and transportation. have no criminal record and represent no security risk. be in good health, as confirmed by a medical examination, if needed. produce proof of your intention to leave Canada after completion of your studies (such as a return airline ticket). In Ontario, it is compulsory for international students to acquire private health insurance to cover possible medical and hospital care costs. The college or university you will attend can assist you in accessing this type of insurance. All persons accompanying you to the country during your studies (spouse, child) must also have health insurance coverage. This Government of Ontario website provides an overview of the procedure to follow for international students wanting to study in Ontario: admission requirements, application procedure, lodging, costs, scholarships, etc. You will find relevant information of a general nature in this site, however, please note that answers to some of your specific questions may differ according to the institution you have chosen. It is therefore recommended that you further your research by consulting the websites of your chosen institution. Explore our institutions. The Canadian Information Centre for International Credentials (CICIC), established in 1990, offers information and referral services to assist individuals and organizations with the recognition of diplomas and of professional credentials for the purpose of studying in Canada.. The Ontario Universities’ Application Centre (OUAC) processes all admission applications for every Ontario university. Once you have selected your programs or institutions, you must submit your application through this site. Be aware that all programs of study indicated are not necessarily taught in French or bilingually, since this site encompasses all Ontario universities. To learn more about the CAAT application process, please visit the websites of La Cité (www.collegelacite.ca) and of Collège Boréal (www.collegeboreal.ca).